Look for Eric Pitassi (#62) to make a big impact in the 'Cats offensive interior this fall. Linfield is almost two full weeks into fall camp and right around the corner is that 1st day off. Yes, that wonderful 1st day off after almost 2 straight weeks of meetings, workouts, practice, meetings, workouts, practice, etc. You probably don't feel too bad for the players because they having the opportunity to play college football at one of the best football programs in the country but I have to keep it real. At this point in camp, that day off is the carrot at the end of the stick. I'll be trying to get out to one the 'Cats two practices tomorrow to get some more sound and video from camp. It looks like this weekend is going to be a beautiful one in the valley. 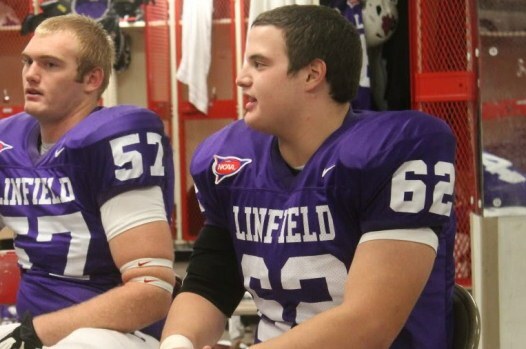 After the 'Cats wrapped up their nightly meetings I had great conversation with Linfield Offensive Guard, Eric Pitassi. Eric is in his 2nd year in the program after transferring from the University of Montana and made an immediate impact in starting 4 games last season and logging heavy minutes at the guard rotation. Look for the Sophomore (eligibility) to be a key member of the 'Cats offensive interior this season as Linfield's offensive line returns a large bulk of returning starters, youth, and a great group of newcomers. Eric and I talked about his feelings on where the 'Cats offense is headed, where his focus on improvement was this offseason, working daily with Offensive Line Coach Doug Hire, his overview of the 'Cats offensive line, and what he would tell a recruit about why Linfield is a perfect choice for those looking to receive a great education and play football at a high level. I have to say that I've enjoyed these interviews greatly. The players are constantly confirming my feelings about this program and why we love the 'Catdome so much. These players are challenged but treated fairly and honestly by a GREAT coaching staff, they care about the well-being of their fellow teammates, and live the Team, Excellence, Attitude, Class pillars of this program. I can't say enough about how Linfield football does it right. I’ve had a number of people ask me why the blog is called ADvantage Catdome. So instead of repeating the explanation over and over, I thought I would just lay it out here. Back in 1986 my father took me to my very first Linfield game, the final regular season game vs. Pacific (Linfield would roll the Boxers on their way to their 3rd NAIA title). I was 10 years old at the time and I can remember seeing these banners the pep squad/students have hung up on the fences around the Catdome. They read “We have the ADvantage”. It wasn't until later that my dad told me Coach Rustchman’s first name was “Ad”. Get it now? Good. Go ‘Cats! Kids Day this Sunday at the 'Catdome! 2013 fall camp is up and running!!!! !